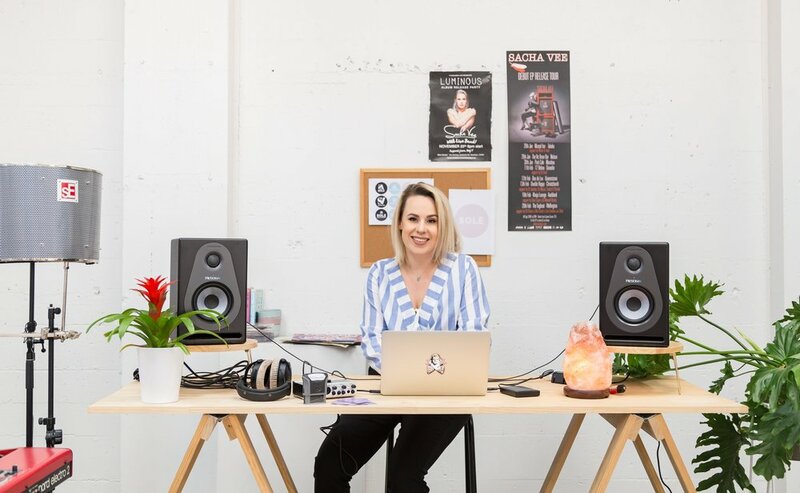 "Sacha has developed considerable skills, capability and reputation as an artist and educator here in New Zealand and also in Europe and Japan. That experience and her global perspective have given her an enormous wealth of knowledge to pass onto up and coming musicians." - Tom Rainey, Head of Creative Industries, Ara InstituTe of Canterbury. Sacha Vee, Sacha van Beek, grew up in a music loving family with West Indian and Dutch roots who supported anything she put her mind too. At school Sacha was taught a good work ethic and to reach for the stars so she was involved in as many music, dance and drama groups as possible. At age 16, she attended the National Jazz competition in Tauranga with the St Andrew’s College Jazz Band and ended up winning the Best Jazz Vocalist award. It was on the flight home she decided to pursue a career in music. After completing a Bachelor of Music in Jazz singing at Canterbury University and a Masters of Music Therapy degree at Massey University in Wellington she released her 1st self titled SACHA VEE EP in 2010. A TV appearance on ‘Good Morning’ promoting the EP singing her first single ‘Patience’ and a successful national tour lead to her securing headlining spots on the Christchurch, Tauranga, Queenstown Jazz Festivals. As well as gaining the attention of Tokyo based music label Sweet Soul Records (SSR) who re-released the EP in Japan (May 2011). This was Sacha Vee’s entry into the International spotlight. At the same time her friend in Holland sent a video of her singing to ‘The Voice of Holland’ panel. She was accepted to fly over to Amsterdam to do the blind audition which eventuated in her becoming a top 10 finalist and being heard by over 4million people in Holland. This competition opened a lot of doors for Sacha as well as being introduced to dutch producers Killing Skills, I.N.T. & Chef Red. Together they produced Sacha's 2nd EP Rising One, released by UK based label BBE Records in 2015 (J Dilla, Bilal, Will.i.am) featuring the hit single 'Hey Sugar'. In 2016, Sweet Soul Records released her debut album Luminous in Japan. Luminous made it to No.3 on the NZ Heatseeker charts and the hit singles 'Stonecold', 'Monday' & 'Feels Good' were selected by NZonAir for ‘New Tracks’ (Kiwi Hit Disc). "LUMINOUS is worthy of NZ music awards and global stardom. An outstanding and compelling album, which is highly addictive." As well as her performance experience, Sacha Vee gained reputable international songwriting experience signed as a Topline Artist and Songwriter for Downtown Music Publishing (DMP). She has written, recorded and collaborated for a number of successful international artists. The most successful being polish Hip hop artist O.S.T.R. with whom she has garnered more than 40 million views on youtube, 3 x platinum albums and won the prestigious ‘Fryderyk Hip Hop album of the year’ award in Poland 2017. Along the journey Sacha has consistently upheld a passion for teaching other people to sing and songwrite. She has delivered music workshops in Universities around the country, been head hunted for music workshops abroad in Japan and Amsterdam and been employed by prestigious schools such as Herman Brood Academy (Utrecht, Holland) who have seen past students succeed such as Martin Garrix (currently the World’s No.1 DJ). Presently Sacha holds the position of Head of Songwriting at the Ara Institute of Canterbury. Equiped with her music degrees, music industry knowledge, 15 years of teaching and performance experience it is only fitting that in 2017 she was chosen to be a Music Mentor for the NZ Music Commission. Now in 2018 Sacha is pursuing another one of her dreams…to start her very own music academy, SOLE.